In 1955 a young secretary named Grace Grissom, decided to pursue her dream of becoming a business owner. Grace, along with support of her husband Herbert founded Mrs. Grissom’s Salads. During that period of history, America was still recovering from the effects of WWII. There were no golden arches and the term “fast food” didn’t exist. Women had entered the workplace during the war and discovered life outside the home. They also discovered the overwhelming challenge of preparing family meals from scratch after working all day in the factory. That was also the year Grace Grissom, a young Knoxville, Tennessee secretary, dreamed about owning her own business. One of Grace’s friends had a small, struggling company nearby that made prepared sandwich spreads and sold them through local grocery stores. Grace instinctively knew this was the business she had dreamed of starting. Grace, and husband Herbert, became business partners with their friends and before long were making major improvements in the way the products were made and sold. Within a year, the Grissoms bought out their partners and Mrs. Grissom’s Salads was born. Today, we continue to manufacture our branded products from Nashville, Tennessee. Our customers include grocery chain stores, dollar stores, and independent grocers throughout the Southeast, and parts of the Midwest (see our “where to find” tab for locations near you). 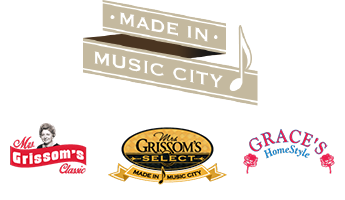 The commitment to producing and distributing our product continues on all the Grissom branded products. If you do not see our products, ask your store to add. If you are a retailer- let us know how we can help you grow the salad category. Select the best, select Mrs. Grissom’s.